2019 is a critical year for our union; our members will be negotiating 43 new contracts this year across our Local, including some of our largest Chapters. These negotiations will impact the day-to-day work of approximately 33,000 people and their families. That means tens of thousands of working families with the opportunity to improve their lives and their communities this year. What an amazing chance we have to stand together, lift our voices, and say that all working people—whether Black, brown, Asian or white—deserve better. During the Great Recession, many of us made sacrifices on behalf of our communities, including taking pay cuts and making concessions. Today, billionaires control more wealth and power than ever before while the economic recovery has left most of us behind. This is shameful, and we say no more. Working people everywhere deserve to live with dignity; we deserve affordable housing, quality child care, and workplaces where we have a voice and a seat at the table. Join our fellow SEIU 521 members who are fighting for a California that works for everyone. The contracts we negotiate in 2019 must address the rigged economy that allows the wealthiest among us to prosper while working people are left behind. That’s why we are fighting for strong contracts that will balance the scales for working people, invest in our communities, and ensure we’re all able to keep a roof over our heads and food on the table for our loved ones. There is strength in our numbers and unity. Let’s stick together! Winning great contracts starts with making sure that our co-workers are always informed and active in our plan to win. A strong Contract Action Team (CAT) helps in keeping us engaged and united. Take action by becoming a CAT and helping us win in 2019! 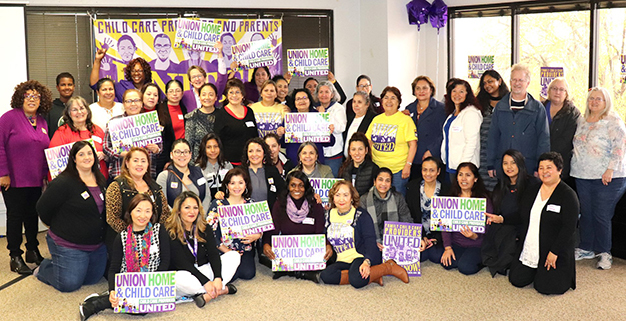 Nearly 300 Family Child Care Providers across the state were joined by SEIU International President Mary Kay Henry on February 16 as we celebrated our progress in the fight for Child Care for All and a union for providers. After 15 years, it’s time we get a seat at the table so that we can fix California’s broken child care system. But we can only do that with help from our SEIU 521 sisters and brothers. Redwood City and Mexican American Opportunity Foundation both recently won contracts that improve wages while protecting the services we provide to our community. In the Central Valley, a member from the Kern County Department of Public Health won over $10,000 in back pay. As we gear up for contract negotiations we must remember that these are the types of protections and improvements we need to fight together for. It’s Women’s History Month! Our union is made up of a large majority of women and many of us are women of color. A strong union contract guarantees equal pay for equal work helping to close the gender and racial gaps. Wages for union women are 26% higher than non-union women. Comments about Together We Rise Newsletter – March 2019 are welcome. Off-topic comments and other violations of our community guidelines may be withheld or removed. Comments do not appear immediately after posting.